RCPW is the only name you need to know when you're searching for high quality and budget friendly salt spreader parts. We carry an absolutely massive collection of replacement parts, pieces and components, for nearly every brand, make and model on the market. Just a few of the types of discount salt spreader parts we offer include spinners, electric and hydraulic motors, pumps and reservoirs, augers, all types of belts, bearings and hardware, batteries, chains, chutes, covers and lids, and on down the line. If a salt spreader uses it, we have it, and when you buy from RCPW you'll never have to worry about paying full retail price again. So feel free to browse our huge collection of discount salt spreader parts by category or conduct a search below. You can also call our knowledgeable team for assistance at 800.937.7279. We'll help you quickly find what you need, and get your salt spreader back up and running in no time at all. 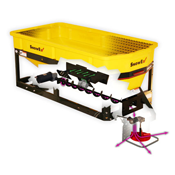 We have a large selection of salt spreader parts & accessories. Enter your part number above to find the item you need!